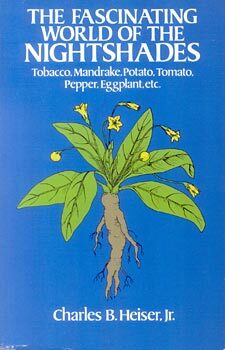 Tobacco, Mandrake, Potato, Tomato, Pepper, Eggplant, etc. 1st edition published as Nightshades: The Paradoxical Plants in 1969. Of all the plants that have figured conspicuously in human history, the Solanaceae, or nightshades, are among the most fascinating. Some are extremely useful to man; others, because of the alkaloids they contain, can be deadly. In this unique and entertaining book by a noted botanist--the first popular-level treatment of nightshades--readers find out which is which, and a great deal more. Written in a charming, entertaining style, the text reviews the origin, history and uses of these phenomenal plants. Topics range from witty and informative discussions of hot peppers and other beneficial species such as the earth apple, mad apple and love apple (today identified respectively as the potato, eggplant, and tomato) to amusing accounts about tobacco--the "filthy weed." Included are intriguing stories about the poisonous belladonna and Jimson weed; mandrake and henbane, plants with purported medicinal properties; and the petunia, a nightshade that has found a permanent place in flower gardens. Professor Heiser also considers the use of nightshades as a potential food source in global areas plagued by recurring food shortages. Well-indexed, with an appropriate selection of bibliographical material, The Fascinating World of the Nightshades is lively reading for anyone who enjoys plants: botanists, gardeners, naturalists or just interested laymen. The text is not only useful as supplementary reading material in general and economic botany courses, but also belongs in the library of any plant or nature lover. "The author has brought together a great fund of factual information, fascinating anecdotes and stories about the members of this plant family...rewarding reading for all interested in plants. Very highly recommended."